Indian Spring is a 55+ community in Boynton Beach, Florida. This community offers residents a low-maintenance lifestyle thanks to a monthly homeowner's association fee covers general maintenance of the community grounds as well as exterior maintenance of the homes. It also offers the ability to become a member of the Indian Spring Country Club for social and golf opportunities. Active adult buyers looking at homes for sale in Boynton Beach, FL will want to take a closer look at Indian Spring. Development of Indian Spring began in 1981 and was completed in 1998. It consists of 1,901 homes nestled with 24 neighborhoods. Single-family homes, attached villas, townhomes, and condos can all be found in the community on a resale-only basis. Some of these neighborhoods have their own outdoor pool and small clubhouse. Condos in the community range in size between 1,100 and 1,700 square feet. Each condo offers two to three bedrooms and two full baths. These units are in two-story buildings that offer scenic golf course and lake views. Parking is easy with assigned parking spaces as well as guest parking. Townhomes in the community offer great low-maintenance living. These two-story townhome buildings offer two single-level units with an elevator to take you to and from your floor. Each home offers between 1,200 and 1,850 square feet. Attached villas in the community range in size between 2,000 and 2,500 square feet. Each home offers at least three bedrooms, three bathrooms, and a two-car garage. Most homes feature golf course views and have private neighborhood pools. Single-family homes in the community range in size between 1,450 and 4,000 square feet with at least two bedrooms, two bathrooms, and a two-car garage. The association fee in each neighborhood is different, but all of them feature low-maintenance living and some have private pools. Indian Spring residents have access to outdoor pools and small clubhouses located within their neighborhoods. However, if they are interested in paying for a membership, they can join the neighboring Indian Spring Country Club to take advantage of many world-class amenities. While membership is not required to live within the community, it is required to use any of the amenities at Indian Spring Country Club. Indian Spring Country Club offers a social and golf country club experience to those who choose to become a member. The 52,000 square-foot clubhouse is home to a myriad of amenities. Inside the clubhouse, residents can be found playing billiards in the game room, dining at one of the three restaurants, or enjoying a show at the performance theater. Members can utilize the fitness center and aerobics studio to stay in shape. A day spa offers an assortment of massages, facials, and other relaxing services that are sure to please. An on-site golf shop is also available for golfers looking to get the latest gear for their next game. Amenities found outside the clubhouse include an Olympic-sized pool and whirlpool spa, two 18-hole championship golf courses, and miles of walking and biking trails. There are various kinds of memberships available at the club. The first is the Full Golf Membership, which provides members with access to 36 holes of championship golf and priority tee times, dining access to the member’s dining room as well as the Grille Room, a fitness center, valet service, card rooms, social events. Any children under the age of 26 can also be included on this membership. The Social Membership provides all of the aforementioned amenities except that access to the golf course is more limited. There is also a Dual Club Membership, which allows someone to be a member at both Fountains and Indian Spring Country Club. That provides access to 72 holes of championship golf with no cart fees as well as complete access to both clubhouses. There is also an Executive Golf Membership for those 55 and younger. There is a vibrant social scene at Indian Spring Country Club. With a full-time lifestyle director, there are always social clubs, activities, and parties scheduled for club members. Members enjoy each others company playing cards, socializing poolside, or on one of the many guided trips to the area's local attractions. The low-maintenance lifestyle in the community provides residents with more time to enjoy all of the world-class amenities offered in the country club. 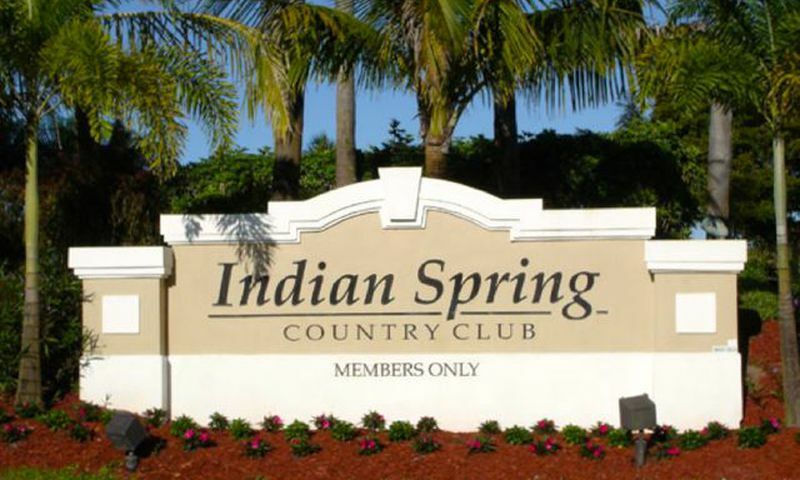 Located in Boynton Beach, Florida, Indian Spring Country Club offers residents access to all of their everyday needs as well as fun and interesting opportunities. For daily shopping and grocery needs, residents are a short drive from multiple Publix as well as The Boys Farmers Market and Walmart. They can also take care of shopping, banking, and other needs at Village Square at Golf, The Fountains of Boynton Shopping Plaza, and Boynton Trail Centre. Boynton Beach has plenty of local favorites for breakfast, brunch, lunch, and dinner, including Flakowitz of Boynton, Dune Deck's Mimosa Cafe, and Bagels &, not to mention various national chains. Along with the golf course at Indian Spring Country Club, residents are close to Pine Tree Golf Club, Westchester Country Club, and Delray Dunes Golf & Country Club, just to name a few. For when they want to get out in nature, residents can take a short drive to Loxahatchee National Wildlife Refuge, Green Cay Nature Center & Wetlands, and the Seacrest Scrub Natural Area. They’re also a 15-minute drive to the beach. Indian Spring is close to multiple health care facilities, including Bethesda Hospital, JFK Medical Center, and Heartland Health Care Center. Nestled between Highway 95 and the Florida Turnpike, Indian Spring offers easy access to all of the area’s major urban areas, including West Palm Beach, Fort Lauderdale, and Miami. Day trips to one of the many beaches along Florida's Atlantic Coast are frequent among residents. For longer trips or visits from the grandkids, Palm Beach International Airport is a half-hour drive while Fort Lauderdale-Hollywood International Airport is 45 minutes away. Clubhouse - 52,000 Sq. Ft. There are plenty of activities available in Indian Spring. Here is a sample of some of the clubs, activities and classes offered here. Condos in the community range in size between 1,100 and 1,700 square feet. Each condo offers two to three bedrooms and two full baths. These units are in two-story buildings that offer scenic golf course and lake views. Parking is easy with assigned parking spaces and ample parking for guests. Please Note: Floor plans are not available at this time. Townhomes in the community offer great low-maintenance living. These two-story townhome buildings offer two single-level units. Each home offers between 1,200 and 1,850 square feet. With private elevators to your unit these homes are luxury living at its finest. Please Note: Floor plans are not available at this time. Attached villas in the community range in size between 2,000 and 2,500 square feet. Each home offers at least three bedrooms, three bathrooms, and a two-car garage. Most homes feature golf course views and have private neighborhood pools. Please Note: Floor plans are not available at this time. Single-family homes in the community range in size between 1,450 and 4,000 square feet with at least two bedrooms, two bathrooms and a two-car garage. The association fee in each neighborhood is different, however all of the neighborhoods feature low-maintenance living and some have private pools. Please Note: Floor plans are not available at this time. My husband and I love in to our home here about 5 years ago. We started with a social membership and now have the sports membership. We don't golf enough to need a full membership and it's nice they have plenty of membership options and are pretty flexible. The clubhouse, golf course, pools, tennis and everything is wonderful. All our friends who come to visit us here rave about the community and our home. We have one of the single family homes here in the Hamptons section. Our neighbors are great and we have a lot of fun here. 55places.com is not affiliated with the developer(s) or homeowners association of Indian Spring. The information you submit is distributed to a 55places.com Partner Agent, who is a licensed real estate agent. The information regarding Indian Spring has not been verified or approved by the developer or homeowners association. Please verify all information prior to purchasing. 55places.com is not responsible for any errors regarding the information displayed on this website.